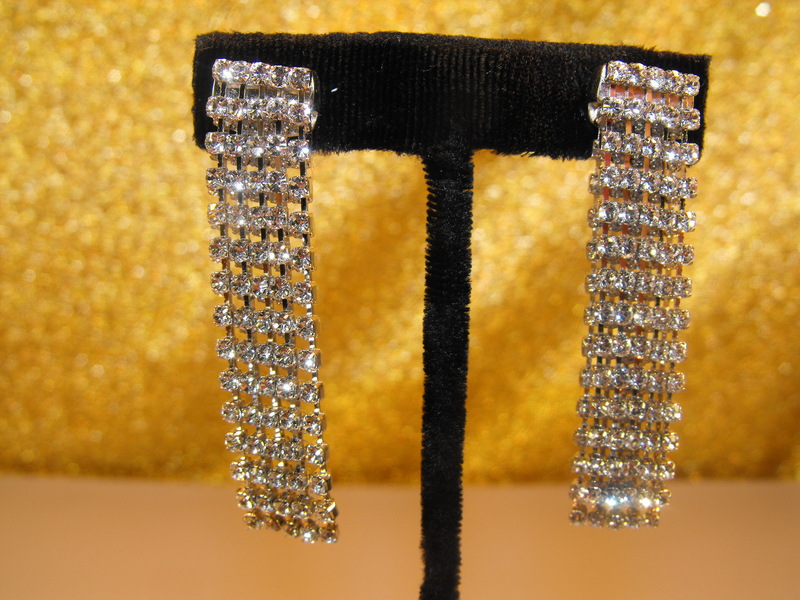 Just in time for the holidays or any dress up occasion come these double layered (5 strands each) Kate Spade waterfall pattern rhinestone earrings. 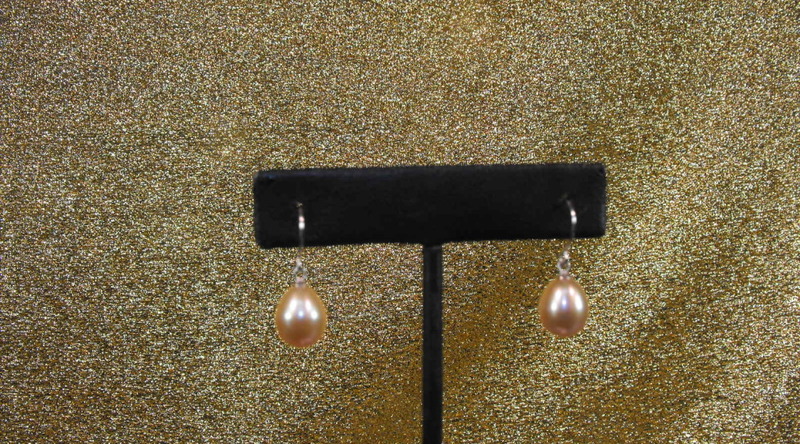 They measure about 1/2″ wide and about 2″ in length. 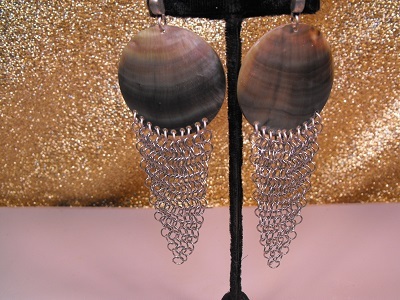 They are sure to make a statement by a waterfall or anywhere else. 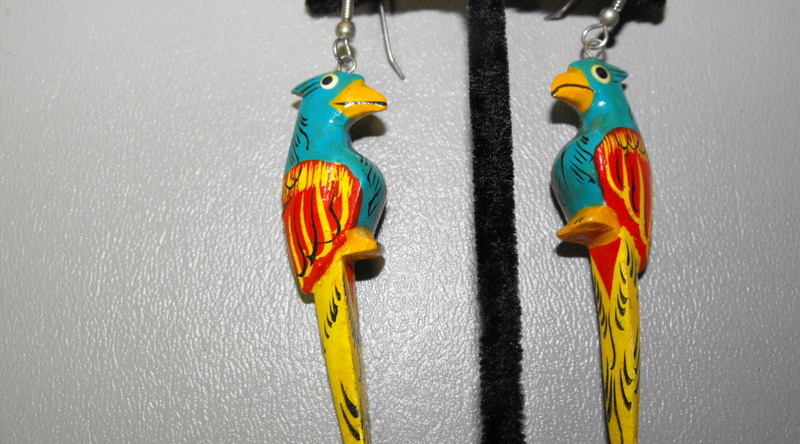 We could not resist….we saw them we had to purchase them. 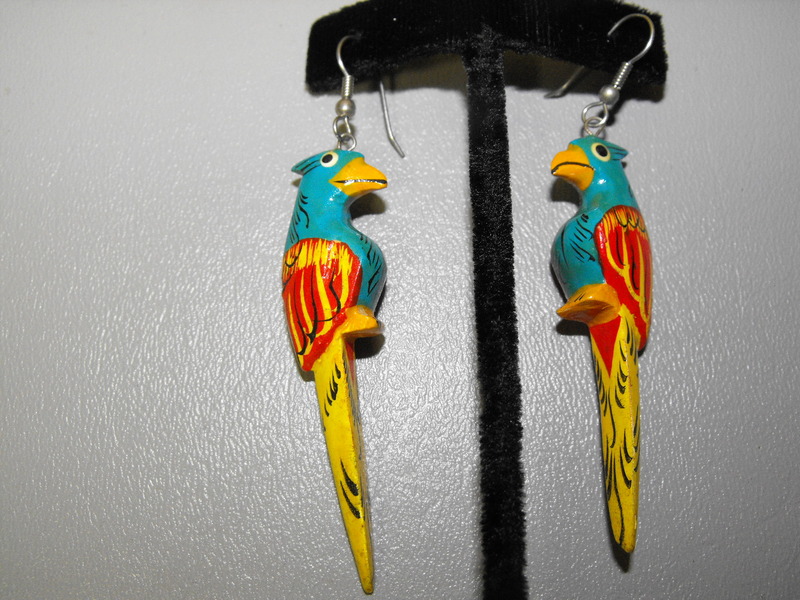 Very lightweight, hand carved, hand painted wooden Macaw or Parrot pierced earrings ( whatever name you prefer). 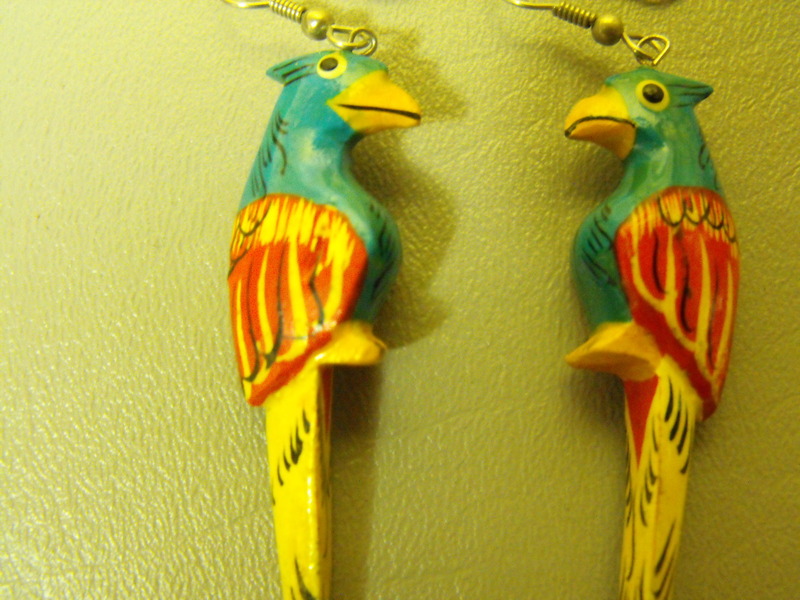 The birds measure about 2 1/2″ in length. 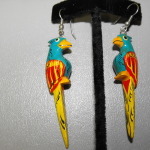 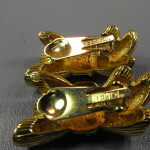 So whether you are a bird lover or want something to wear while eating “crackers”, make a statement with this great pair. 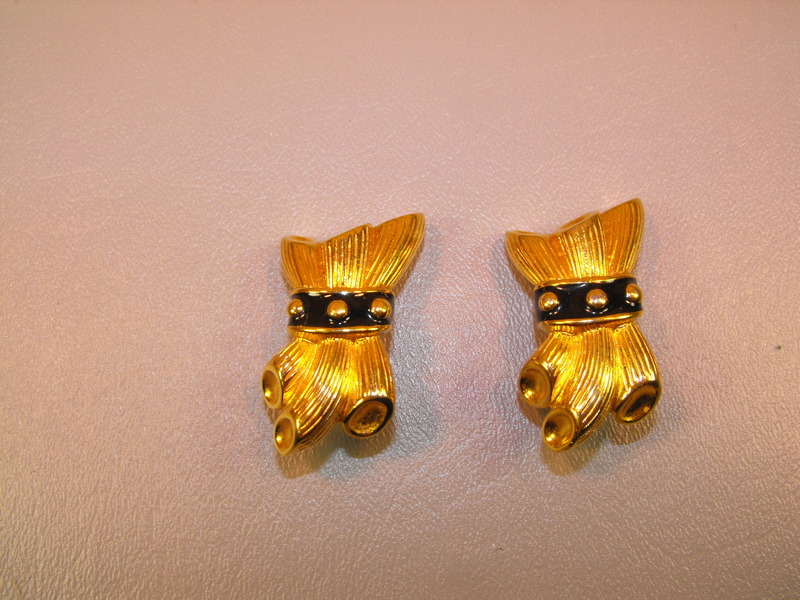 Condition: Previously worn, but in great shape. 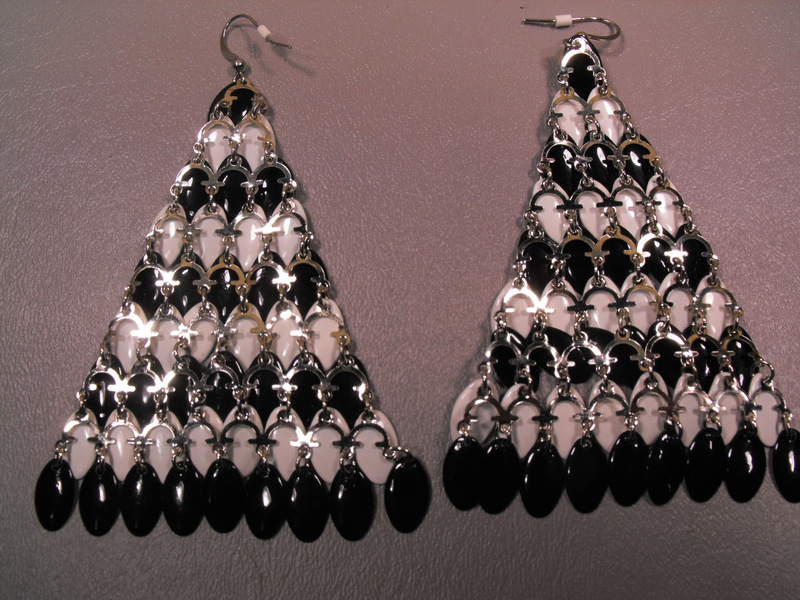 Every size, shape and age. 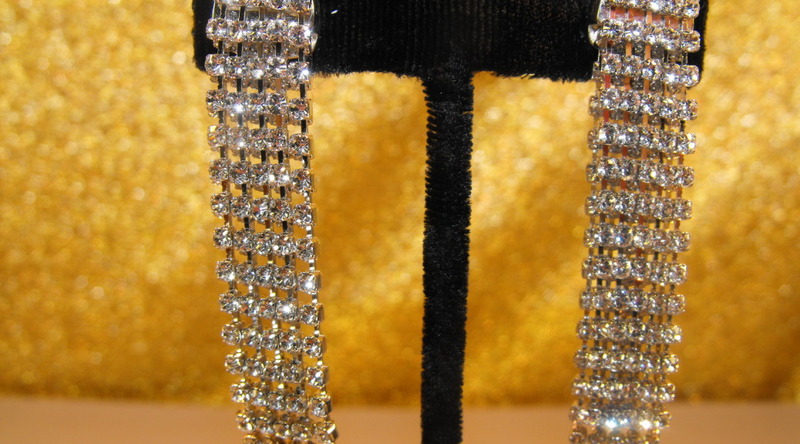 In necklaces, pins, earrings and bracelets…..as timeless as fashion itself. 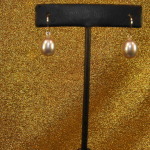 Presented here are a pair of teardrop, Cultured Freshwater Pearl earrings set in pierced sterling silver. 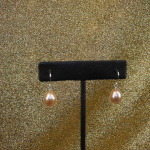 The pearls are about 7-8 mm in size and have a slightly pinkish hue . 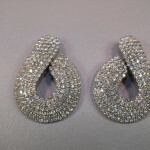 Isn’t it about time you made a fashion statement? 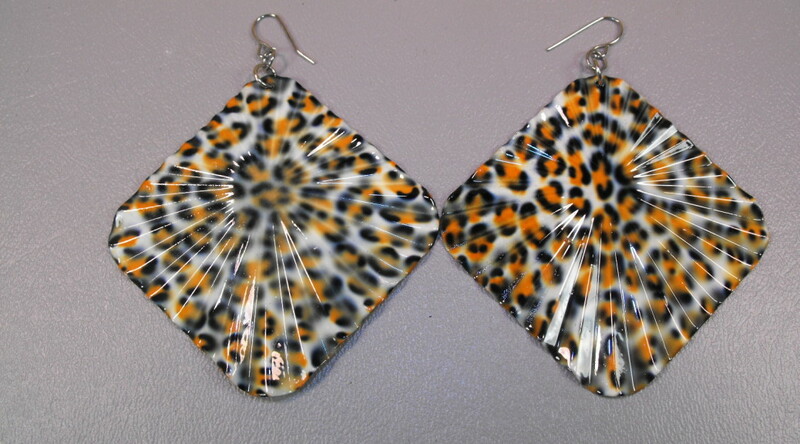 How About A Walk On The Wild Side ? 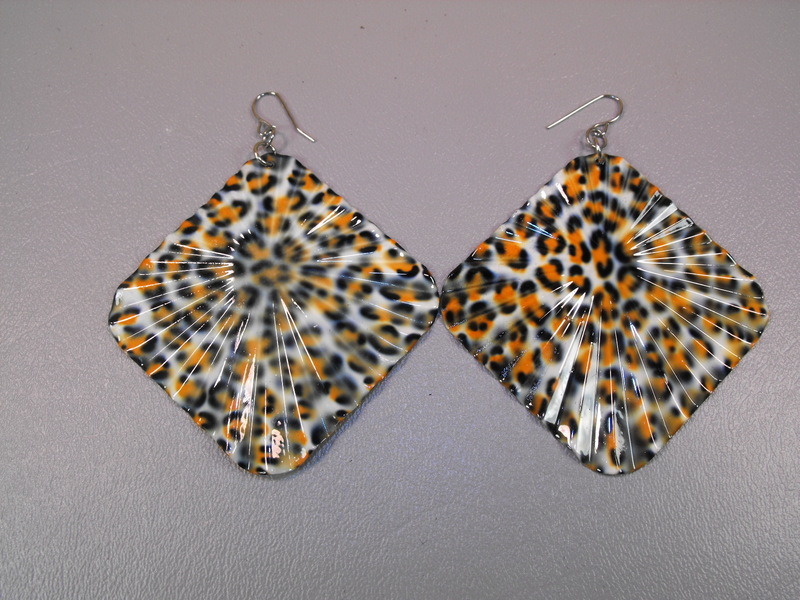 We don’t know whether these earring have a Leopard or a Jaguar design. 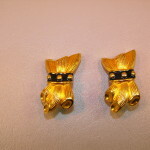 What we do know is that they are fabulous patterned pierced earrings about 2″ long on each side. 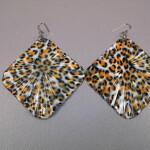 They are very very lightweight and will make a wild side statement. 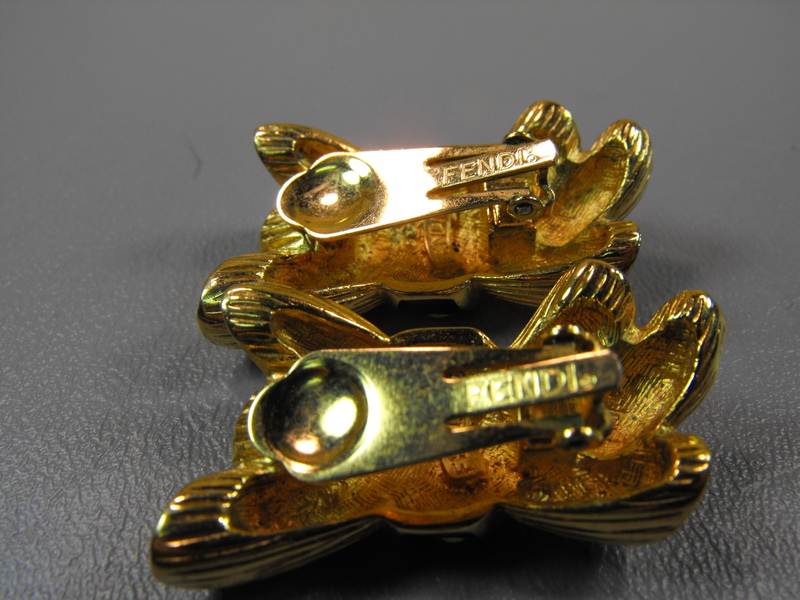 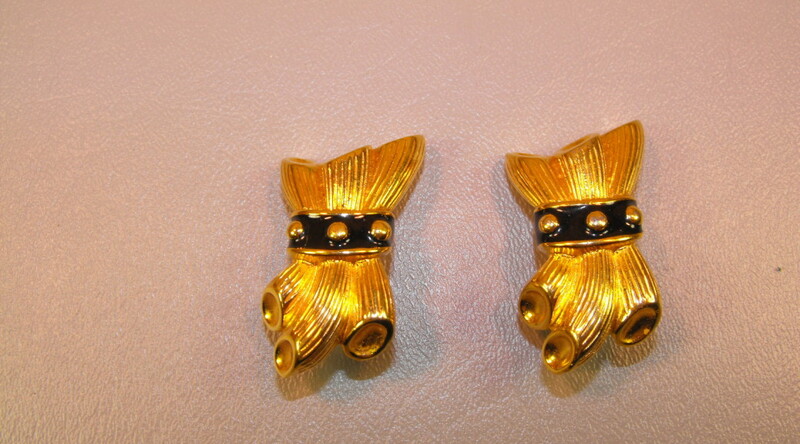 FENDI signed clip on earrings in a cluster scroll design with black enamel band. 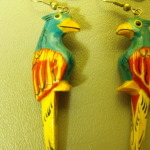 The earrings are about 1 1/2″ long. 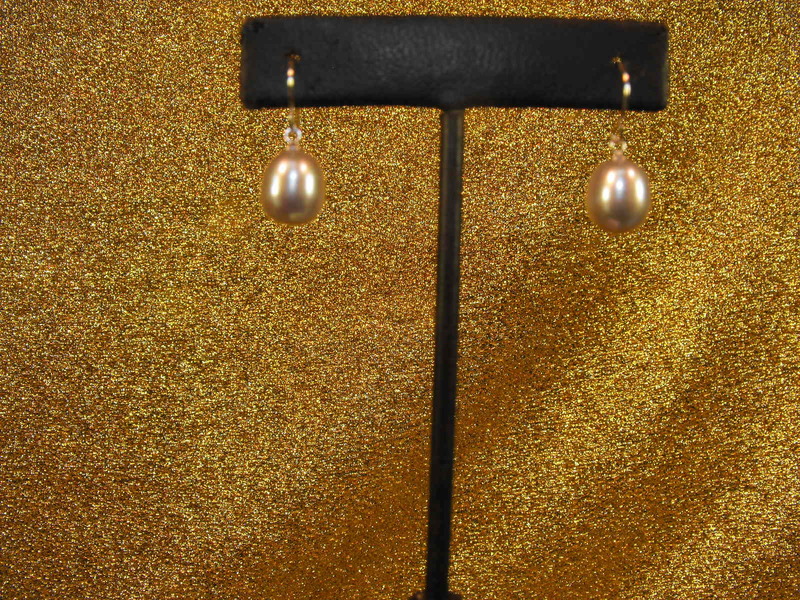 Very chic, very tailored and easy to wear with anything. 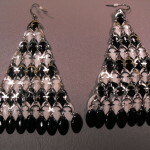 You won’t be able to “fend” off the compliments with these statement earrings !! 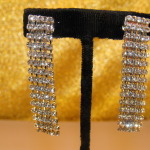 Condition: previously worn, but in great condition. 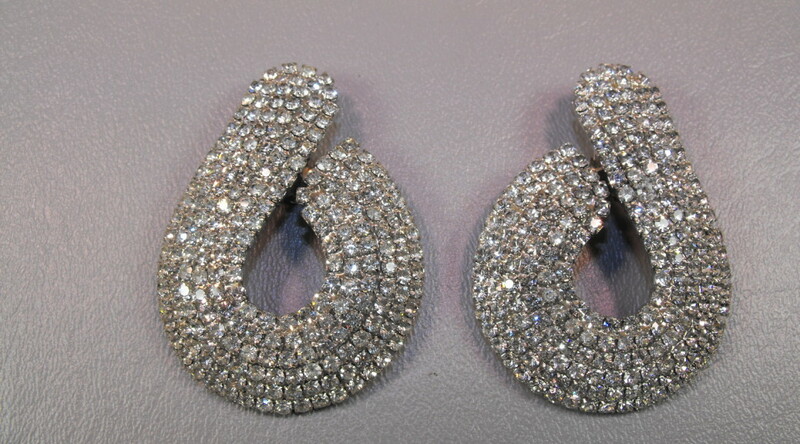 TWA Super G Constellations, those 1959 Cadillac Fins, Mamie Eisenhower‘s famous first lady bangs (by the way, she wore a lot of Trifari jewelry specially made for her) and rhinestone jewelry….in this case fabulous swirl rhinestone clip on earrings…..all individually prong set…not glued in. 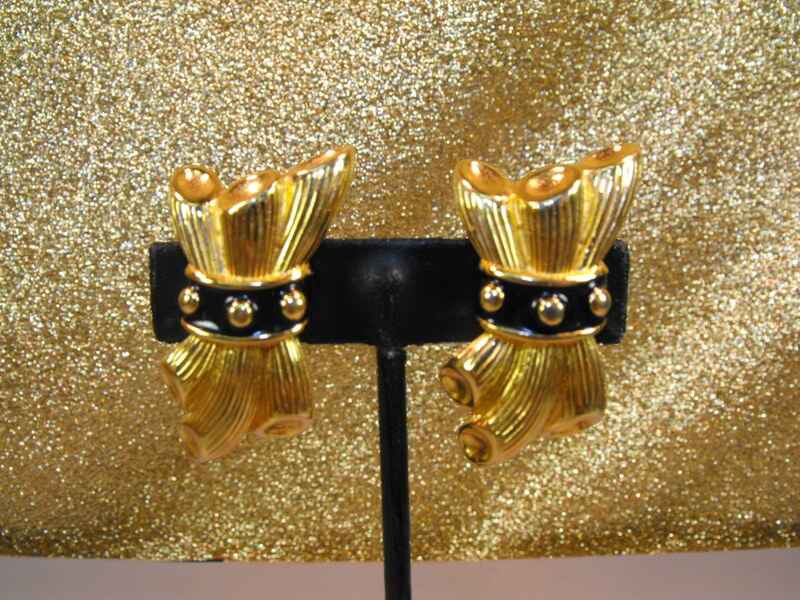 Make a 1950’s statement in 2014! 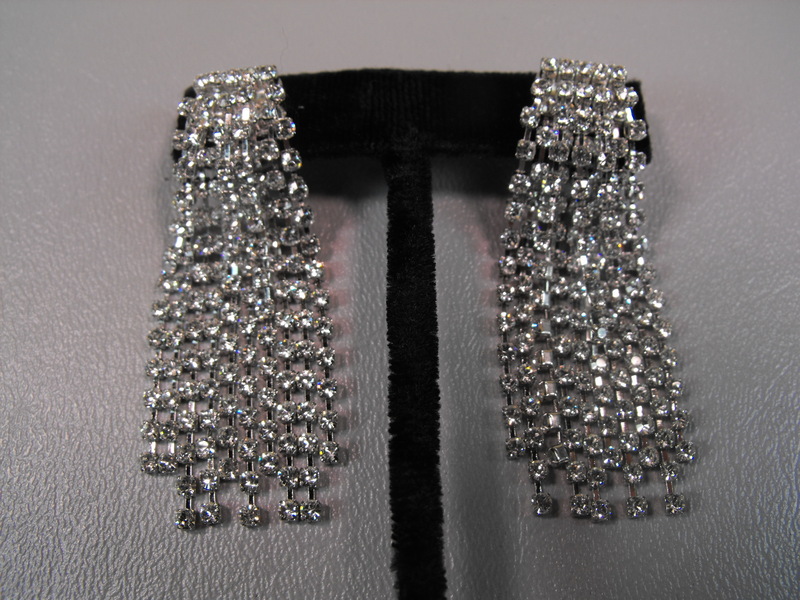 Condition: Previously worn, but in great condition and all the stones are original to the earrings. 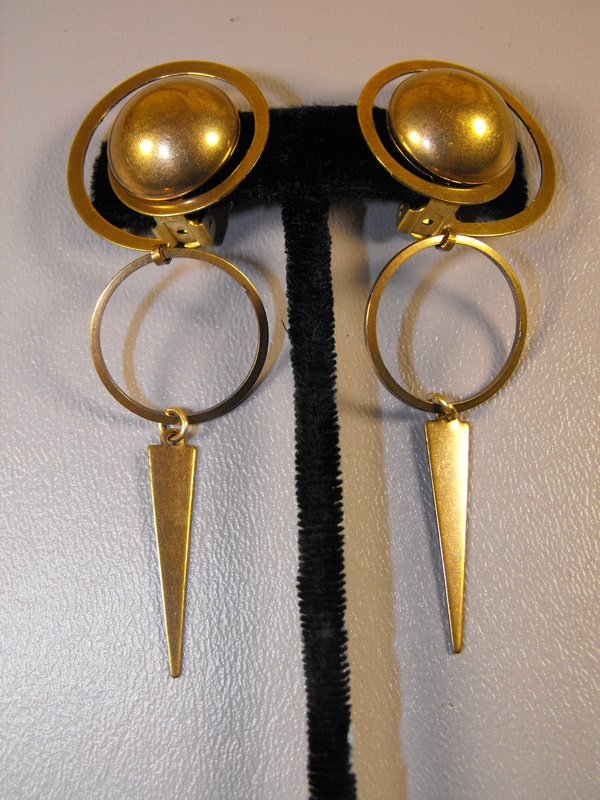 Before too long we will be packing for trips to outer space, but in the meantime here are a pair of Jan Michaels signed brass space swirl dangle clip on earrings. 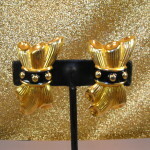 They are a delight with an art deco flair as well. 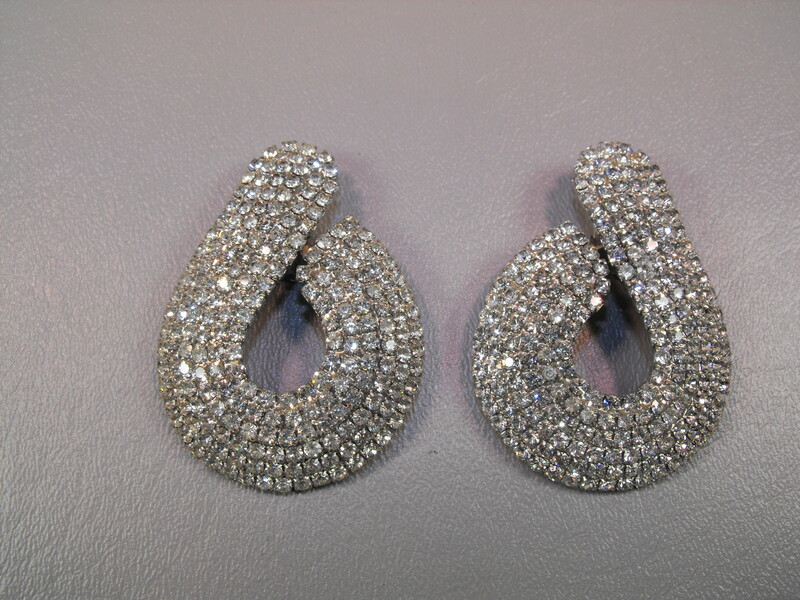 The earrings measure about 3 ” in length. 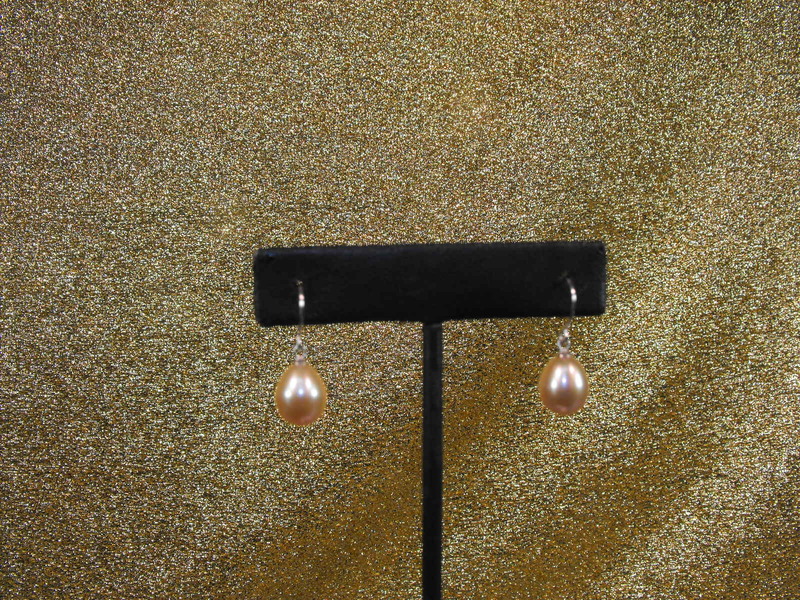 They are very light weight and make an “out of this world” statement! 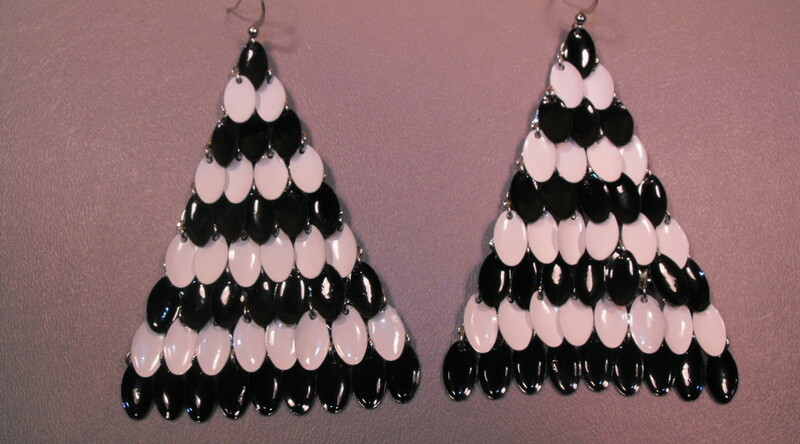 Add drama and a stunning look to your face with these triangle earrings in black and white enamel oval discs all individually hinged. 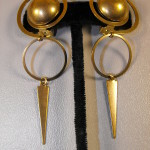 They are pierced and measure 3 1/2″ long and 2 1/2″ wide at the bottom of the triangle. 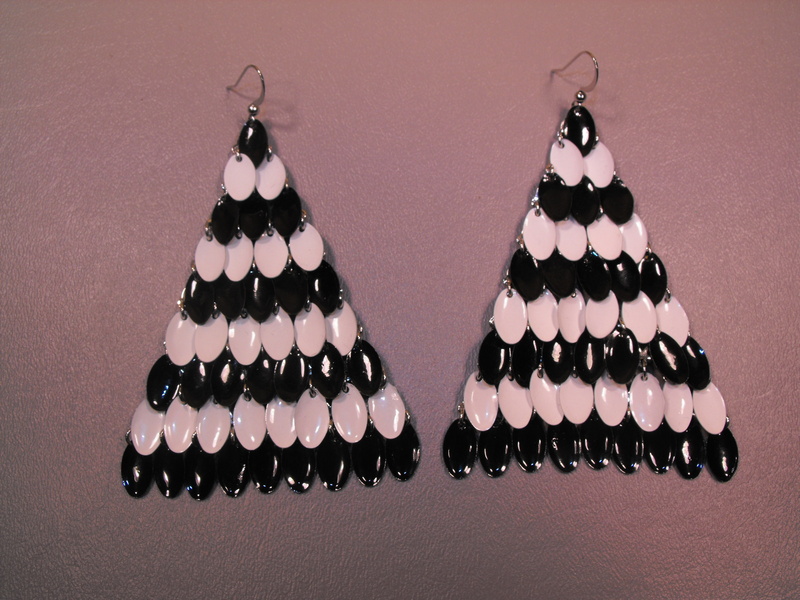 Making a statement with very light weight triangles! 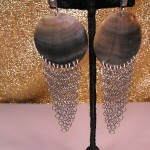 Here are Ferrara designed mesh earrings with shell (Abalone) discs and drop chain mesh. 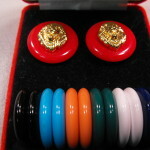 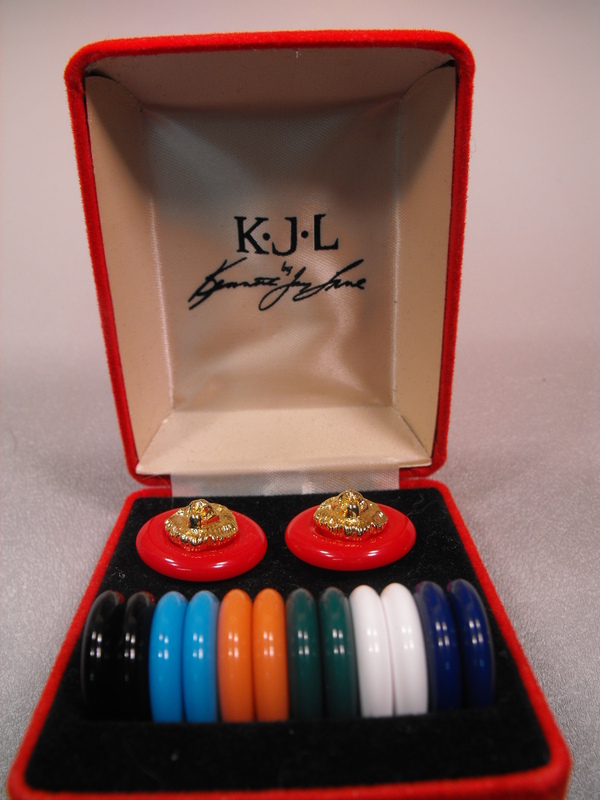 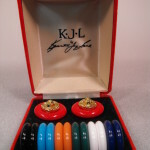 The discs measure 1 1/2″ in diameter and the total length of each earring is about 4″ long. 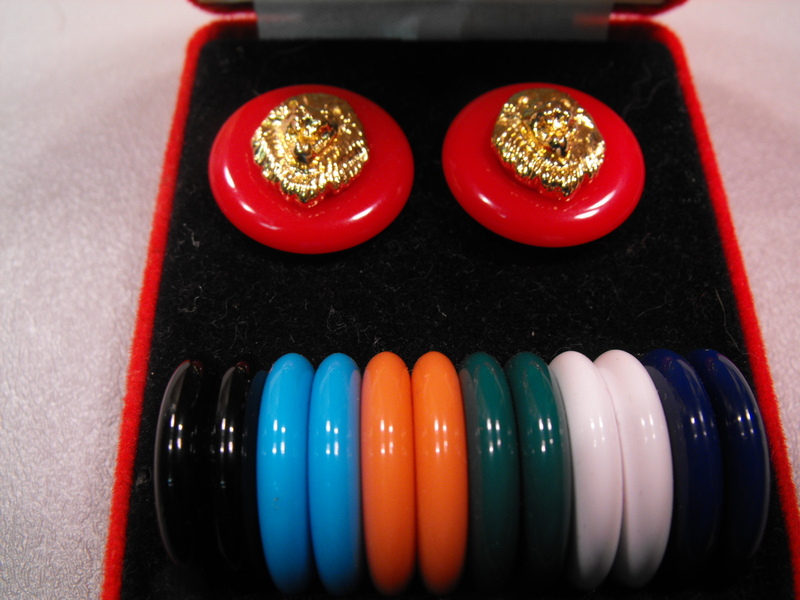 The earrings are made for pierced ears. 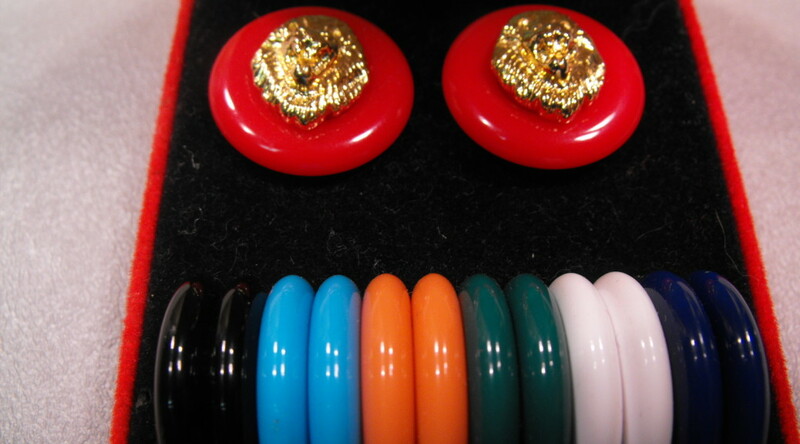 Ferrara designed pieces are much sought after. 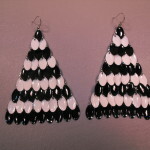 They are very lightweight and make a beautiful statement.